Israeli Prime Minister Benjamin Netanyahu has arrived in Washington to ramp up pressure against the emerging nuclear agreement between the US and Iran. Many Jews in both America and Israel are expressing outrage at the move. 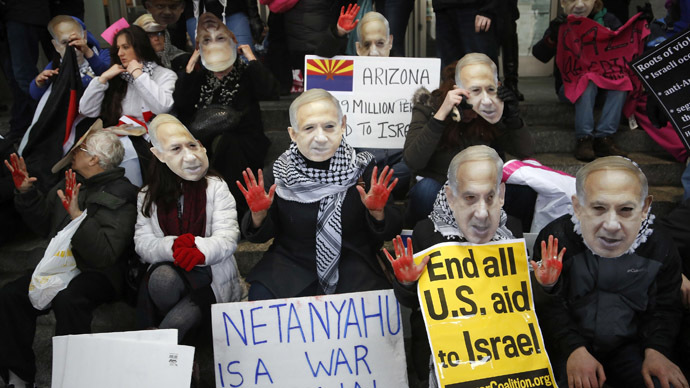 Hundreds demonstrated outside the building in Washington, DC, where Netanyahu is due to address a top pro-Israel lobby group. Police dragged some of the protesters out of the conference hall. Netanyahu is set to give a speech at the US Congress on Tuesday, having accepted a Republican invitation and causing consternation among the Democratic leadership. The premier’s plan is to warn the US over the possible nuclear deal with Iran. "I feel deep and genuine concern for the security of all the people of Israel. I will do everything in my ability to secure our future," Netanyahu said before boarding his flight. He also called his visit a “fateful and even historic mission” and said he felt like “an emissary” of the Israelis. His trip comes about two weeks before an election back home on March 17. The US and Israel have been at odds over the Iran’s nuclear program: Washington seeks to allow some nuclear activity for the country, while Tel Aviv opposes Tehran’s nuclear program altogether. Last week, Netanyahu came under fire from Washington’s UN envoy Samantha Power and National Security Advisor Susan Rice, who both accused his decision to speak at the Congress without the official permission from the presidential administration. In particular, Rice said the partisanship caused by Netanyahu's looming address was "destructive to the fabric of US-Israeli ties." President Obama refused to meet with the Israeli PM during his visit, while Vice-President Joe Biden and Secretary of State John Kerry are both abroad. US Secretary of State John Kerry has warned against public discussion of the ongoing nuclear talks between the US and Iran as part of the P5+1 negotiating group, as this might damage the process aimed at preventing Tehran from developing nuclear weapons, AP reported. “We are concerned by reports that suggest selected details of the ongoing negotiations will be discussed publicly in the coming days,” Kerry told reporters in Geneva on Monday. Owen Olterman, an analyst at the Tel Aviv Institute for National Security, told RT that Obama and Netanyahu have irreconcilable differences in terms of their mentality and life experience. “They have very different ways of looking at the world. For President Obama, his formative experience was working in Chicago as a community organizer. He has an optimistic view of how human beings respond to change. For Benjamin Netanyahu, his formative experience was having his father tell him about the Spanish inquisition,” Olterman said. Some two dozen Democrats are set to boycott the speech, according to unofficial estimates. "We know a great deal about the emerging agreement... In our view, it is a bad agreement," the source added, as quoted by AFP. The source concluded that the speech at the Congress could become “the last brake” for ending the deal, Reuters reported. The PM’s visit comes just a month before the deadline on the framework deal, on March 30, and the negotiators plan to agree on the technical details of the accord by June 30. Iran has repeatedly stated that its nuclear program is only intended for peaceful purposes. On Saturday, Iran’s Foreign Minister Mohammad Javad Zarif accused Netanyahu of attempting to undermine the deal to distract the world community from the Palestinians' unresolved bid for an independent state. "Netanyahu is opposed to any sort of solution," Zarif said.